i have a layout to share today, from CK's scrapbooking tips & tricks: summer fun & travel issue. as seen in the Scrapbooking Tips & Tricks: Summer Fun & Travel issue, from Creating Keepsakes magazine. copyright creative crafts group. posted with prior permission from the publisher. i was given the assignment to create a summer/travel themed, using the colors red, orange, and yellow. a "fire" color scheme. and i also was to incorporate glitter paper. i admit, i stressed over this assignment quite a bit. lol! i tend to stress when i think i don't have photos that will work with what i need to do. it wasn't until the day before this layout was due, that i realized i had photos of alyssa from her trip to hawaii with her dad and grandparents four years ago. i knew i would be using my glittered cardstock, by american crafts. i choose not to use the orange, only because the shade was all wrong, when matched up with my patterned papers. i also knew that i wanted to make a sunset, with my papers, across the top of the layout. i used some scrap paper, to sketch out the sunset design. i made a mark, where i wanted the center of the rays to hit. and then i drew lines to the edge of the paper, to create my rays. i cut each one out, and traced it onto my cardstock, and then cut those out. then i re-assembled all the pieces, and adhered them all down to the base of my pages. then i machine stitched along each ray. if this sounds confusing and time consuming, you'd be right to think that. lol! it did seem to take me forever to get that part of the layout done. my pattern papers are from fancy pants and making memories. the fun "summertime" circle accent was hand cut from a sheet of the fancy pants paper, and placed on a sun that i diecut with my slice machine. the majority of my embellishments are all from little yellow bicycle. the canvas border, the canvas stickers, journaling blocks, puffy sticker. the flowers are from making memories, and the buttons are from fancy pants. i just noticed i must have taken this photo before i journaled my layout. lol! i wanted to add some more color to the edge of the second page, so i cut some circles from the red, orange, and yellow papers. it's an easy way to add splashes of color, and also gives you a nice spot to cluster embellishments. creating keepsakes has a brand new special issue hitting stands this week, called budget-friendly scrapbooking. "Prepare to make your stickers, papers, die cuts, and more go further than you ever imagined possible. 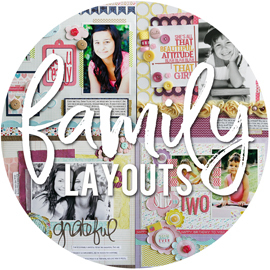 With the tips and tricks in this special issue from Creating Keepsakes, you'll learn how to create beautiful scrapbook layouts using your scrapbooking leftovers and minimal supplies. Whether you're a new scrapbooker or have been creating for years, we'll show you how to stretch your scrapbooking budget to its fullest." here's a sneak peek at one of my layouts featured in this special issue. the idea was to use a themed collection, to create a non-themed layout. and here's another insider look into the issue, which you can purchase HERE. i have a free copy to give away to one of my lucky blog readers! just leave me a comment, to be entered in the random drawing. i will leave comments open until thursday night, and announce a winner on friday. i slacked on getting any posts typed up, before i left for CKC. just ran out of time. and now i'm sitting here in my hotel room, with all of 12 minutes left on my 24 hour internet access, and feel the need to squeeze a post in. lol! so i'm leaving you with my favorite song right now. it was playing on repeat on my ipod, for most of my flight here. I have a layout up, over on the bella blvd blog today. this was one that i created for the booth at CHA. we were saving these for our "back to school" week feature, which happens to be this week. you can read more about my layout, what i did, and see some detail shots, on the bella blog. kerri asked me to be a part of her design team, along with 3 other extremely talented scrappers! i could not be more excited about this, since i have grown to love my silhouette more and more every time i use it. and kerri's designs appeal to me and my scrapping style so much. i'm really looking forward to creating for her, on a regular basis, and seeing what the other girls come up with. i know it's going to be a lot of fun! about a month ago, the talented jen gallacher asked me if i'd be interested in guest designing for her august stretch your sketch class over on two peas in a bucket. i love working off sketches, so i jumped at the chance. i actually had no clue what i was going to do my layout about, until last weekend. one of alyssa's friends came over, to work on a school project. and i happen to hear them talking about books. turns out, her friend saw a list of books that alyssa has hanging in her room, and asked about it. when she was in the 7th grade, they had to keep track of all their reading for the school year. listing books, authors, and number of pages they read. in the 10 months they were in school, alyssa read 57 books. and not just little books. big ones, like the twilight series. i had always commented, on how that would make a great layout. to list them all, so that we could look back on it. she's had the list hanging in her room for 2 years, and i finally did what i said i wanted to do. i used a mix of crate paper and my mind's eye pattern papers, for this page. i cut my main title words, "fifty seven", from pattern paper, using my silhouette. and then i used two different kinds of bella blvd letter stickers, to complete my title. i also cut the circle grid piece with the silhouette, from pattern paper. i had a background shape, that was 5 circles high and 5 circles side to side. since the sketch was only 4 circles wide, i just deleted a row of circles before i cut the piece out. instead of actually journaling about this story, i decided to simply type up all the books off her list. these are in the order she read them, right off her list. and i think there might be one or two duplicates in there, since she occasionally loves a book so much, that she'll read it a second time. the row of books stamp is from a studio calico kit, from the beginning of the year. then it was time to embellish my circles. this was the fun part. i knew that i just wanted to add random, fun embellishments to each circle. although, it could have been fun to add in some little photos of some of alyssa's favorite books. didn't think of that until i was typing this. lol! i just dug around in my stash, looking for things i could add, in coordinating colors. reds, aquas, greens, browns, and a bit of yellow. i have a mix of buttons, brads, flowers, chipboard pieces, 3D flower stickers, and even a plastic clock piece. 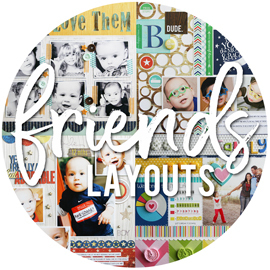 you can check out jen's layout, download an instructional PDF, watch her video, and see the other two guest designers HERE. thanks jen, and 2peas, for letting me play along this month! did you get a chance to check out the newly released bella buzz newsletter? for our "challenge on the blvd" section, i invited one of the local artistas, katherine mcelvain, to take on a challenge with me. 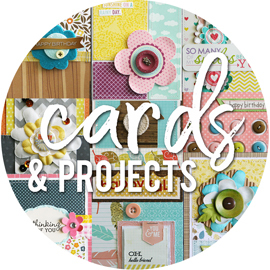 "Create a layout, using at least 1 pattern paper from each of the 4 new collections, at least 3 different colors of letter stickers from the 4 new collections, and at least one other sticker or embellishment from each of the 4 new collections." i love mixing pattern papers together. whether it's from different manufacturers, or from different collections from the same manufacturer. you might not think to mix papers from a sports collection, a halloween collection, a fall collection, and a christmas collection. but it can definately work. i think it worked just perfectly on these photos of the girls, from an apple picking outing years ago. i love the font on the alphabet stickers, that come on the alphas+bits sticker sheets. i used the green and the brown ones for my title, and used the white numbers for the year these photos were taken in. that white circular background piece was cut with my silhouette. make sure and check out katherine's take on the challenge HERE. the creating keepsakes september 2011 issue, has an article called "scrapbooking 100 photos in an evening", written by deena wuest. i remember when they asked us for some brainstorming ideas, on taking on the idea of scrapping 100 photos in one evening. is it do-able? i didn't even have to think about it. YES, it's totally do-able! so when i was asked to contribute to the article, i already had a plan of what i wanted to do, design wise. as seen in the September 2011 issue of Creating Keepsakes magazine. copyright creative crafts group. posted with prior permission from the publisher. now, what would the theme of my pages be? i wanted to do some sort of "year in review" type album. but not the normal month-by-month set-up. i thought it would be fun, to break down the year, into themes. 10 photos on a layout (2 page spread). 10 layouts total. that equals 100 photos. easy. my first theme was "favorite school moments". instead of doing individual layouts, for different types of school moments (band, projects, friends, graduation), why not combine some of your favorite moments onto one layout? it's a great way to sum up the entire school year, and touch on all the highlights of the year. my design plan, was to choose 10 photos for each spread. one of those photos would be my focal photo. a favorite photo from the bunch, or one that was special for a particular reason. for my "favorite school moments" layout, i choose this photo of alyssa, from her 8th grade graduation. it was a very big night for her, and a very proud moment for us, as her parents. 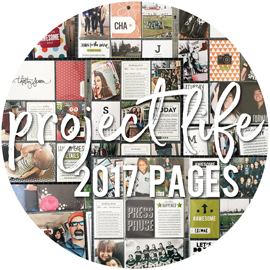 along with the one larger photo, i would include my journaling, a title block, and the rest of the page would be made up of patterned paper. my plan for the other 9 photos, was to create a digital template in photoshop, and print them all as one 12x12 collage. i went with a simple grid, 3 across and 3 up and down, for my first template. and then i used that template to create the second page of my spread. i pulled up all 9 of my photos, and dropped them into the collage, cropping each photo to fit the space. once i was done, i uploaded my finished collage to costco, and had it printed as a 12x12 photo. that's all this page is. 9 photos, just like that! i used my silhouette to cut out my title. i LOVE the "moments" title piece, and how it has the thin outlined piece that goes on top of the regular title piece. since my themes, for the 10 layouts, all revolve around moments, i could easily cut "moments" over and over. it's not like using letter stickers, where eventually, you're going to run out of letters. and if you're planning ahead, you could even cut out "moments" ten times at once, to save some time. i also cut out "school" with my silhouette, and added the "2010 favorite" with tiny alpha stickers. i knew i would need a lot of room for my journaling, since i was summing up the entire school year's highlights. once i knew how much space i had for my journaling, i made a text box in my word processing program, and typed up my journaling to fit the space. i printed it out onto some white graph patterned paper, and added it to the page. i also created a summer themed layout. "favorite family fun moments". a little inside secret, is that my title was originally "summer moments". i think someone else had a title similar to that, so i was asked to change it. that's how "family fun moments" came to be. for this layout, i choose a favorite photo of alyssa and sarah, in the swimming pool. this was at my brother's house, at a family get-together. i went with fun, bright colors for my papers. this time, i printed my photo as a 5x7, and went with a horizontal photo. 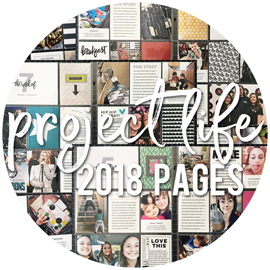 just like on the first layout, i decided where i wanted my photo and my journaling, and then built the title piece and patterned papers to fill up the page. i created a second photo collage in photoshop, for this layout. i still went with a grid design, but i varied the sizes of the photos, to add some interest. and here's how my other 9 photos for the layout looked in the collage. printed as a single 12x12 photo, which completes the second page of the spread. keeping the design simple, and minimizing the thought that goes into being original on every page, i cut my title once again with my silhouette. i originally had "summer" cut with the silhouette, but when i changed it to "family fun", i choose to just use some letter stickers. i did add a very simple embellishment to this layout. i used a template to create a whimsical sun, from my coordinating pattern papers. and i added three pre-threaded buttons to the center. journaling printed on yellow pattern paper. we didn't do a whole lot during the summer of 2010. so i choose to journal about some of the girls favorite things to do during the summer, which goes along with the photos i choose. some of the other ideas i had for this type of themed "year in review", were favorite sports moments, favorite work moments, favorite birthday moments, favorite holiday moments, and favorite everyday moments. i actually had my list of 10 themes, that would make up 100 photos, and now i can't remember what else was on my list. i wanted to share a few of the things that i've been working on for bella blvd, over the last few weeks. i've been putting in a lot of hours over there, and it's nice to see a few of our big projects going "live" today. first up, we have a re-designed newsletter out today. it's been about a year since the last issue, and we're really excited to be back up and running. 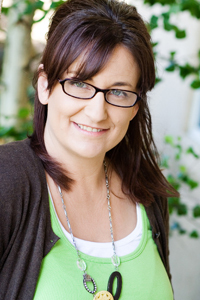 you can check out the august 2011 bella buzz HERE (just click on the august 2011 link). while you are there, make sure and sign up for the newsletter subscriber list, and the newsletter will come right to your inbox every other month. just fill out your info on the little yellow box, found on THIS PAGE. next up, we have announced our first ever bella artista design team call, for 2011-2012! we are so excited to get this search underway, and see all the talented designers that are out there. we are looking to put together a fabulous team of girls, that can bring constant inspiration to the bella blvd blog! and i had to share a photo of what i spent the good part of the last few days working on. that right there, is FIFTY layouts. i had the fun job of duplicating a gorgeous layout by one of bella's local artista's, katherine mcelvain, for a special project. 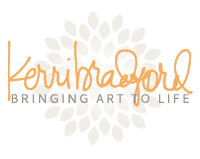 i'm so glad that today is wednesday, and it's my feature day at kerri bradford designs! because i don't think i can sit on these layouts any longer. lol! i was SO excited when kerri asked me to be one of her special guests, for her one year anniversary celebration of launching her own designs. i hope you're checking out kerri's sales, going on this week! today is a good one. those are some of my favorite kits, and i used a few in my projects for today. i have 3 projects to share with you today. 2 layouts, and a card. i love this photo of my girls, and printed it out just a few days after taking it. finally decided it was time to scrap it. all the papers are from lily bee. they were sweet enough to give me a pack of paper at winter CHA, which was 7 months ago. i'm glad i finally got around to using it, because i love the colors and happy patterns. i used a flower border, from the borderlines #1 kit, and cut it from 3 papers. a aqua dot paper, a yellow dot paper, and some brown cardstock. on the left side of the layout, i layered together the aqua dot flower and the brown cardstock flower. i used pop dots on the top piece, and offset them just a tad bit from each other. i added a little chipboard flower embellishment to the flower center to finish it off. for the right side of the layout, i felt like it needed a little something to fill up some space. i didn't have room for a full border. so i simply cut off the stem of the flower, and used just the flower by itself. i layered the yellow dot flower, on top of the brown cardstock flower, using pop dots. and a chipboard flower embellishment to finish it off. i thought the "hello sunshine" title, from the this & that: summertime (just shapes) collection, cut was perfect for this summer photo of alyssa and sarah. i cut the "hello" from red cardstock, and the "sunshine" from aqua pattern paper and brown cardstock. the ribbons and tickets are from my mind's eye, and the chipboard flowers are from sassafras. i try and cut a few extra shapes, when i'm using my silhouette. if i'm sending a piece of paper through, i like to try and use up the space and get the most out of that piece of paper. which is why i cut these shapes out, thinking i could use them on a card. i also managed to use scraps of paper from my layout, along with some ribbon and the extra chipboard flowers i had left. a new favorite layout of mine. all the products on this layout are from my mind's eye. the die cut paper, pattern papers, cardstock (from the reverse side of the pattern), and adorable buttons. the buttons are what i started this entire layout off of. and a secret about that die cut paper. it's got tons of glitter on the backside. and those that know me, know i'm not a huge fan of glitter. i actually adhered a piece of cardstock to the back, to cover it all up, but i'm still finding glitter everywhere. i was trying to choose a title from the say what #1 kit. i knew i wanted to scrap some photos of either haley or nikolas, from when they came to visit me in june. i was debating between the "this girl" title. and the "that boy" title. and then i remembered THIS LAYOUT, that i did a few years ago. and i knew right away, that i wanted to use them together, on one layout. i did the same thing on my titles here, that i did on some of the pieces in the first layout. cut them from different papers, and then layered and pieced them together. i printed out 3 wallet sized photos (2x3) of both haley and nikolas, and adhered them randomly down the sides. i love this little loopy border strip. i cut two of them, from brown cardstock, and adhered them on either side of my pattern paper strips. leave a comment here for a chance to win $50 of your choice of digital download kits from kerri bradford designs. i will leave comments open until friday morning, and i will randomly choose a winner on friday afternoon. good luck! i was lucky enough to meet kerri bradford a few years back, along with loni stevens. i had always loved their work. they both had such a clean, graphic style about them, that really appealed to my clean and linear style of scrapbooking. they both started doing designs for the silhouette store, and then eventually kerri branched out on her own. she's been selling her own designs for a year now, and is celebrating her one year anniversary with a brand new site and a big celebration, all week long. her new site just went live today, and you can see it HERE. i totally ran out of time to blog last night. a friend of mine mentioned a while back, that i havn't done a "facebook randomness" post in a while. so, here you go. some of my status updates from over the last month. some worth sharing, and some that i should have maybe left over there. lol! am stalled on my last 2 CHA assignments. Am procrastinating by playing some game on the iPod where I mow the lawn. Lol! why is it, that i blowdry my hair with a round brush, curling it under. and by the time i'm done, the ends of my hair are all flipped up? makes no sense. the only reason i'm going outside to trim a few plants, is because they're blocking the window to my scraproom, and i don't have enough natural light coming in to get decent photos of my projects. love this time of day. everyone is fed. littles are down for naps. alyssa is working on summer projects for school. sarah is probably on the computer or watching tv. and i get some computer time, to accomplish some work without interuption. it's 2:10am, and i'm waiting for alyssa to get home from the midnight showing of harry potter, so i can go to bed. i have to wake up in less than 5 hours, for work. at least the daycare kids are used to me being sleepy in the mornings. lol! new hair color. went with golden cappucino this time. i know that packaging is getting smaller these days. but you can't go and reduce the amount of hair color in a box, without giving some sort of warning. halfway through applying the color, and i realize there's hardly anything left. so not cool. my eyeballs can edit photos no more. taking a break, to do something fun. like laundry. not fun, but needed. to any opponents i left hanging on words with friends or hanging with friends ... i'll make my moves soon. i promise. kills me to have that many games sitting there, waiting for me. lol! as seen in the July/August 2011 issue of Creating Keepsakes magazine. copyright creative crafts group. posted with prior permission from the publisher. i sort of miss scrapbooking. havn't had as much time to be creative lately. need to make time. i'm itching to cut and paste something. today has been super hectic and busy. a little work, back to school shopping with the girls, a little more work, took alyssa to get her braces off, more work, dinner, a little work, heading to a team parent meeting for soccer, and then back to work. can someone tell me where today went?!?! or what i've actually done with my day?!?! weird when you've been going non-stop, yet you feel like you havn't accomplished a thing. this is pathetic. out of all the words with friends games that i've been playing for the last month, this is the only game that i actually won. no clue who it was. but they gave up before we even started, and i was declared the winner. dropped alyssa off at the high school this morning at 8:00, for sophmore "round up day". picking up her schedule, taking school pictures, ordering a yearbook, and stuff like that. yes, that was a chunk of $$$ to fork out already. "life is good in a house of girls". i'm sure joe has lots of complaints about living with three girls. in fact, i know he does. lol! but at the same time, i think he secretly loves it. for whatever reason, i havn't used stamps on my layouts in ages. so i was determined to stamp on this layout. after digging through my stash, i found this restroom dude stamp. i'm sure that's not the actual name of it, but it's a good description, right? lol! i thought it would be a good representation of joe. and the row of house stamp is one that i have been wanting to use for ages. so, i figured i would work it in some way. i decided to make just one of the houses green, and the others all pink. sort of like one dude house, in a row of girl houses. i don't have a huge selection of ink colors. so i thought i would try using markers on my stamps, which i have never tried before. i did use a small ink pad on for the green house, and then colored all the other houses with a pink marker. i used my silhouette to cut out my title. once from brown pattern paper. and then once from green cardstock. i wanted just the "good" to be in green, and then offset it just a tad over the brown. i also used some tiny pink letter stickers, from cosmo cricket, for the sub-title. i think you all know me by now. and that i always add my journaling last. it was a last minute decision to add some yellow onto the layout. once i had printed my journaling onto some yellow cardstock, i used some yellow buttons to add more yellow to the page.